Yes!! You are reading it right. Its indeed a halwa made of Chikoo or Sapota or Sapodilla. We all are well-versed with the nutritional facts and health benefits of this hard from outside yet soft from inside fruit. I was completely unaware that chikoo can be converted into a delicious sweet dish, before I come across of the recipe in one of the food blogs. I and my better half love to try out new recipes and this very different recipe caught my attention instantly… Yes!! You are thinking it right… I have tried it and it came out well. Since I have tried the recipe I would like to share the same with you all. Try it out and am sure that you will like it too. After all it is a sweet dish!! Peel off the chikoo skin and remove the seed from the centre. Cut the pulp into small pieces and grind it to make a smooth paste. Heat 1 tbsp ghee in a heavy bottom utensil and add the grated khoya. Roast it till it changes the colour. You need to ensure continuous stirring so that it does not stick to the bottom of the utensil. Set it aside once done. Heat the remaining 1 tbsp ghee in the utensil and add the chikoo paste. Roast the same in medium flame until you get the thick consistency and the mixture leaves the side of the frying pan. Add sugar and crushed cardamoms to the paste and cook it for 5 to 6 minutes until the sugar gets dissolved completely. Now it’s time to add the roasted khoya to the mixture. Keep it stirring continuously after adding it in medium flame so that it does not get stick to the bottom of the frying pan. Ensure that there is no lump in the mixture. 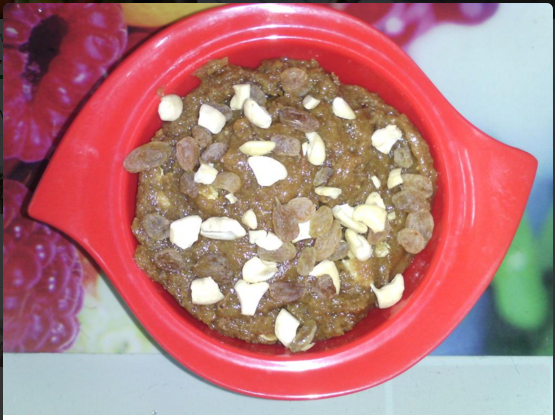 Garnish the sweet dish with dry fruits of your choice and serve. I have never heard of Chickoo Halwa! Your recipe tells me it is easy to make as well. Shall attempt to make it someday soon. Wow! I never heard of a chikoo halwa. It looks yummy and very tempting. I am surely going to try this recipe. good to connect through Alexa. Am glad to connect with you too 🙂 Thanks to Alexa!! A unique dessert I must say!